We’ll talk about Jesus as the Good Shepherd another week. But now – Jesus is the Door. Better, the gate of the sheepfold. If you want to reach my flock, you’re going to have to go through me. Jesus – and John – are concerned about people being led astray. Wallace and Gromit clip. Jesus is bothered about the Pharisees, who want to lay a heavy burden of religion on people. John is bothered about false teachers in the Church, who are in it for what they can get. And when Jesus says ‘I am the gate’ – he means that unless we introduce people to Jesus, we are not kosher. We are not to be trusted. If people try to tell you that they know the way, but they don’t hold up Jesus, then they don’t speak the truth. 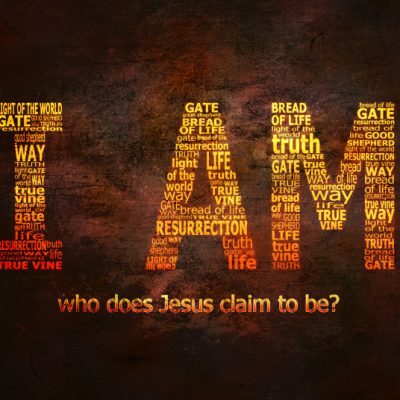 The acid test of true Christianity, and the way that you can distinguish between real and fake: what do you say about Jesus? And Jesus explains: you’ll discover that all the others are in it for themselves. Ezek 34. They’re in it to steal, to kill and to destroy. You’ll see those characteristics in all false religion: a few folk getting wealthy; the quality of people’s lives being reduced, as freedom is eroded and people imprisoned; and people being destroyed, used up and cast away as worthless. And if you see those things in a church, don’t walk away from it. Run away from it, as fast as you can. It is not the Church of Jesus. If you want to reach my future, you’re going to have to go through me. Jesus offers us something amazing: the gift of abundant life. Jesus says that there are two ways out of the sheep pen – to be rustled out over the wall, and that ends in the Preston’s Dog Food factory. Or through the gate – and that path leads to the pasture. There’s a pathway which takes us from safety and protection through to liberty and life. We sometimes misrepresent Jesus here. We make Him into the bouncer at the nightclub, picking and choosing who gets in and who doesn’t. But that’s not it – this story is about protection and possibilities. Jesus alone is looking out for us to save us. And Jesus alone is the way to life. He’ll gladly welcome you in: just come to the door, and ask.